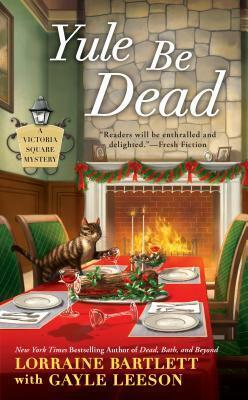 Yule Be Dead by Lorraine Bartlett with Gayle Leeson, is the fifth book in the Victoria Square mystery series. The holidays are right around the corner and Artisan Alley is buzzing with activity. Katie Bonner's former mother in law is coming to visit her. She's not sure why and it's making her nervous. Someone from town is killed in what appears to be a car accident. Katie must figure out what is going on before the holidays are ruined. I enjoyed this book from beginning to end. Visiting Victoria Square, was visiting an old friend. I felt right at home. The characters are wonderful. Katie is a strong young woman that took over Artisan Alley and turned it around. Vance, Rose and the other artists add flair to the story. I see myself strolling around, looking for amazing handcrafted treasures to bring home or give as gifts. I imagine walking over to Angelo's Pizzeria for lunch or one of his new yummy treats. The mystery of this book hooked me in from the very start. With its many twist and turns, it kept me guessing until the very end. I could not put it down. I had to keep reading to find out the answers to all of my questions. I recommend this book to readers who love a story with a small town feel, wonderful characters that feel like a family and a mystery that will keep you up until you find out how it ends. I received my ARC copy of this book from NetGalley and Lorraine Bartlett for review. Definitely checkout the other books from this series. They are worth the read. Until next time Happy Reading.